Looking for the perfect boho boots? Check out these online brands! Boho boots to dream about! Check these fab online brands! Boho boots come in many looks, brands, and shapes. Whether you like tall boots with fringes or the over the top embellished beauties. With a good pair of boho boots, you can turn any outfit into an eye catcher. But if you are not living on the island of Ibiza where to get your favorite pair of boho boots? Online of course! I've made a list of my favorite brands, which also sell online! Have fun shopping! Check out these fab brands! Layerboots: Boho brand from Barcelona with a mouthwatering collection of coin embellished boots and sandals. Make you wish it was summer all the time. EmonkIbiza: If you love Ibiza there is just no way you can miss EmonkIbiza. This ultimate boho boots brand is an absolute dream. No two pairs are the same and every pair is handmade. These boots don't come cheap, but they hold very good sales a few times a year! Worldwide shipping. Mayiha: Not only does Australian Mayiha make fabulous bags and clothes, they also have added a shoe line to their collection! Check out their style here! 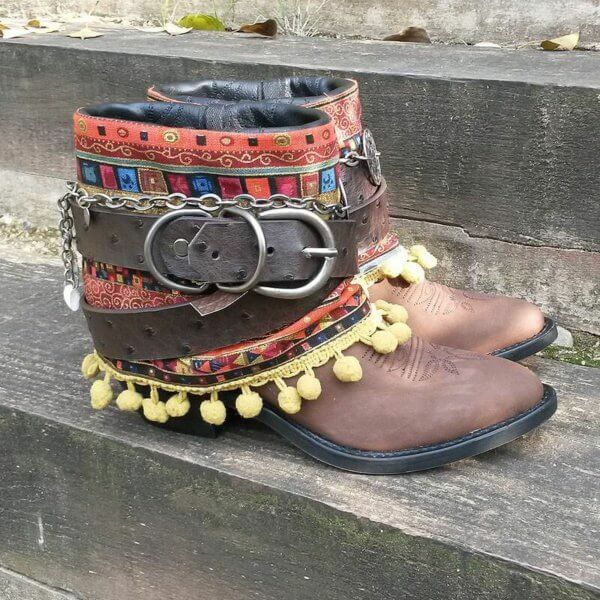 GemsGems: Another boho boots brand from Spain! If you like heavy embellished boots you will love this brand. Worldwide shipping! FreePeople: American brand FreePeople is one of my favorite boho brands around! But did you know they also have a big collection of cowboy boots? Have a look at their boots collection here. Ashalak Ibiza: More into heavy leather boots? Try the Salinas boots from Ashalak. Ask for shipping details outside Europe. La Isla Ibiza: Isla Ibiza is one of the newer boho brands on the block. And yes they make fabulous boots too! For this summer they have added a high wedge boot to the collection. A real must have for every boho girl! Gala Barcelona: Spanish beauty and fashion blogger has created her own line of more affordable boho boots. Her boots come in limited edition only so be quick to get your favorites! Country Outfitters: Cowboy boots come in many styles, shapes, and prices, but stop before you buy online. You really need to try cowboy boots in the store to be absolutely certain of your size. Once you find your favorite brand and perfect size it's save to shop online. My favorite store is the Country Outfitters, because of their wide selection of boots and they usually have a good sale as well! Shipping only within the US. Karma of Charme: And last but not least! Karma of Charme. When you walk into their shop on Ibiza you know you came to boots heaven. This family owned store has been around for a little over 10 years and finally they opened their online store! High-quality handmade moccasins with their trademark logo are not to be missed on the island or in any boho closet for that matter. True perfection! Check for each brand the individual tax and customs fee when ordering online! I hope you enjoy my list of boho boots online! Let me know where you get your favorite boots from! This list will be constantly updated with more brands. The 10 best Online Vintage Stores you Need to Discover! One comment on Boho boots to dream about! Check these fab online brands! Please, how can I buy your boots online? There are no prices, just a couple of photos.